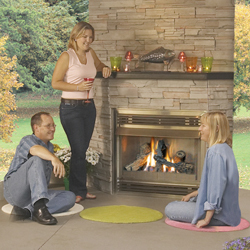 This outdoor fireplace requires no venting and installs almost anywhere. It can be used to provide pure decoration, or to provide some heat to an outdoor living space. A millivolt valve with built-in adjustable flame heat control makes this unit operable with a wall switch. It uses a piezo ignitor. The GSS36N comes natural gas ready, and a propane conversion kit is available. Tested in Canada and USA to the following standards: CR97-003 and CSA CAN1-2.21 and IASUS4. Its BTU input is up to 40,000, with a 99.9% efficiency. The GSS36N requires zero clearance to combustibles. The unit comes with a protective stainless steel cover and stainless steel upper and lower louvers. The logs are exclusive Phazer glowing logs. A safety screen is standard.